Maldives is a stunning holiday destination visited by people from all corners of the world. And it looks like it plans to keep this title with a £320 million floating island that comes with its own golf course. The floating islands will be fixed to the bottom of the sea via cables to minimize the impact that it would have on the ocean floor. 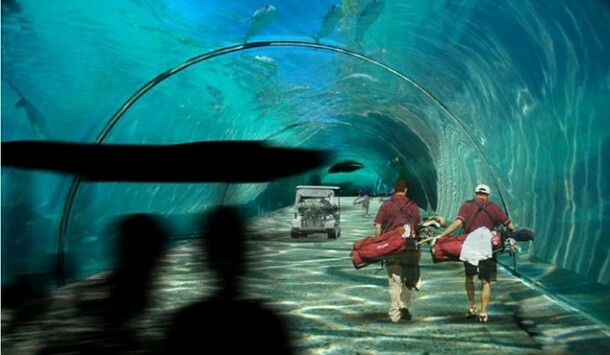 The golf course will be accessible via tunnels on the seabed, and even include a clubhouse where players can relax after a round of golf. The entire plan is made up of 43 private floating islands, each having access to its own beach and private mooring for a yacht. The proposed golf course will prove to be very challenging, with water hazards in every direction. According to scientists, the Maldives is slowly sinking. The more than 1,192 islands are just five feet above the level of the sea and it is feared that they could disappear in the future. 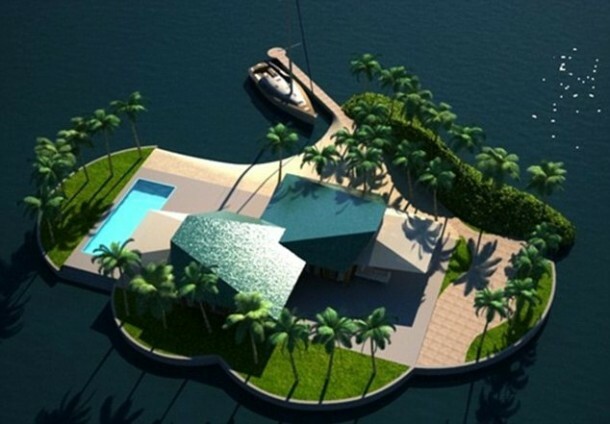 But the floating islands will be unsinkable and keep the Maldives around a lot longer. The project, said to be the largest array of floating islands, are a joint venture between the Maldivian government and Dutch Docklands. To keep costs down, the islands may be manufactured in the Middle East and then be transported by towing, to the Maldives, where they would be anchored. 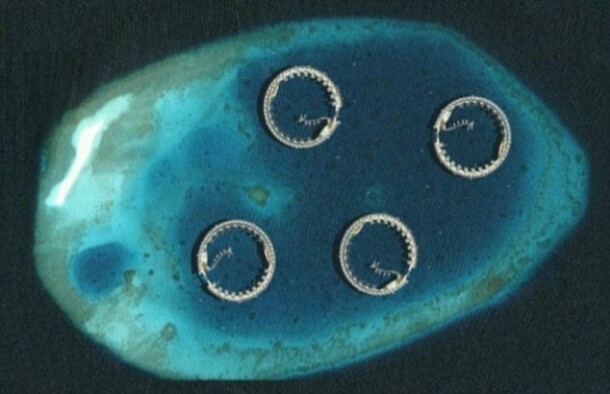 The design was made with swimmers and divers in mind, in a plan that will allow them to swim right under the islands without any obstruction. An even more incredible part of the project includes the ability for guests to rent a submarine and surface directly in the living room of their accommodation. 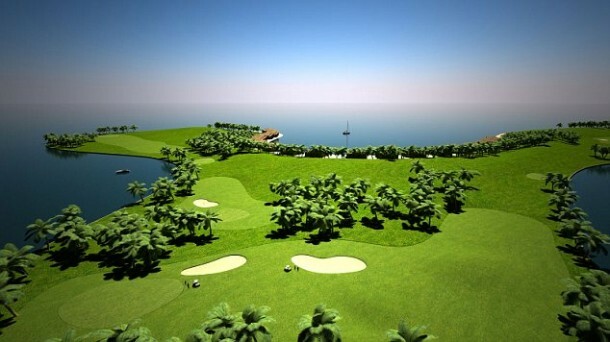 The floating golf course will be the first part of the project, and it will be the first in the world. The floating islands will be located a short distance from Male that can be easily covered by boat. 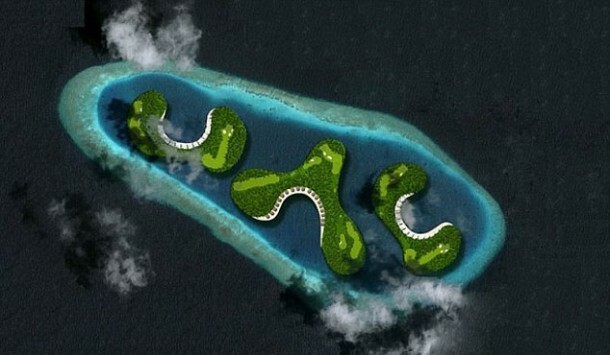 The golf course will be powered by solar energy, something the Maldives has an abundance of. The islands will be be set out in an archipelago configuration and each will have its own villa, with jetty, pool and even palm trees and beach. An amazing, private paradise.